For each of the projects, the exact requirements to the above 4 applications definitely differs. For example, the browser needs to be opened in a different localhost port for different projects along with links to Github or Trello. With AlfredApp, we can call the shell command without launching any command line application with a simple prefix of >. The bash script that we will create will open up various applications, url and paths in the Finder. Tmux is a terminal multiplexer and I use it more oten to layout the arrangement of windows and panes that are running different commands. Usually, I just name the file as the project. In this case, it will be simply blog. As this file needs to be an executable, we will also change the file permission with the command chmod. Lastly, we will symlink this file to a file in a directory where all such automated scripts are stored. This directory has to be found in your path variable $PATH. Now, this script can be run from any location. Here is an example of the blog script file. Next, we will create the tmuxinator project file that will define the various window, panes and commands to fire when starting the project. Let's first create the file blog.yml and create a symlink to the ~/.tmuxinator folder. 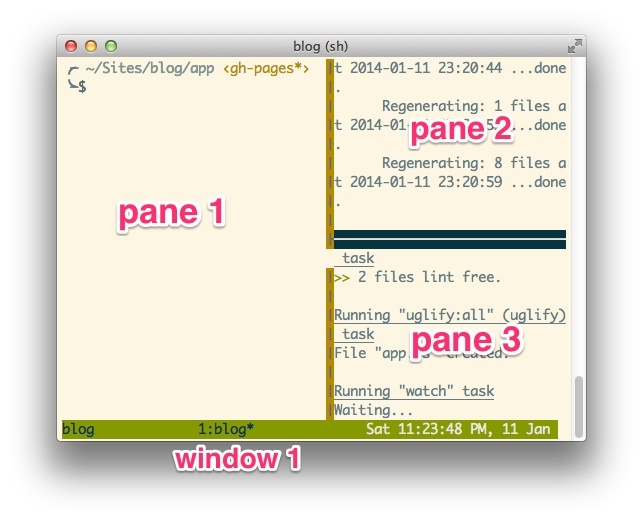 For this blog, the Tmuxinator project is pretty simple consisting of 1 window with 3 panes. And that's all! With these 2 simple files, now whenever we trigger the command blog all the project related elements will open up within seconds! The blog command is pretty simple, so I thought of giving another example for a project called todo. This project consists of full stack development with frontend and backend. And here is the tmuxinator project file todo.yml with 4 windows opening up the development for frontend, backend or api documentation and lastly even the production server. When starting to code, I usually like to do a git pull to sync my code base with the remote repository. Also, when logging into the production server with ssh, I directly cd into the direcotry required. - ssh production -t "cd /path/to/backend ; /bin/zsh"
- ssh production -t "cd /path/to/frontend ; /bin/zsh"
Would love to know if there is a better or alternative way to launching applications other the current method that I am using. What are your thoughts? How do you quick launch your various active projects? Update: You can also follow this discussion on Hacker News with more ideas on how others are implementing this.